Vowing to be “ruthless,” building a mammoth wall, and revisiting crackdowns on federal cannabis prohibition won’t stop barbarous drug cartels or the flow of substances the State deems illegal into the United States — reinvigorating the war on drugs will, in fact, have quite the opposite effect ostensively intended. But if he sticks to his word (unlike with that dubious swamp promise) President Donald Trump will empower the exact criminals he eviscerates publicly by keeping illicit substances the prized goods of the black market. Perhaps the president simply has not examined the overwhelming evidence across-the-board that decriminalization or legalization focuses funds on providing help to addicts, robs cartels of viability, lowers the rate of drug abuse, and empties prisons of otherwise nonviolent offenders. Because the war on drugs wasn’t meant to be won — or, at least, not by anyone but the pharmaceutical industry, the military-industrial machine, the for-profit prison-industrial complex, politicians, and, perhaps incidentally, violent drug cartels. “For that reason, we will soon begin the construction of a great wall along our southern border. It will be started ahead of schedule and, when finished, it will be a very effective weapon against drugs and crime. Not many would argue the presence of violent gang members isn’t desirable — particularly if they involved in violent and destructive behavior — but expecting the deportation of criminals and cartel members to somehow stifle the drug pipeline or thwart criminal activity is ludicrously negligent. Worse, reviving the dead horse that is the cannabis prohibition robs Americans of a vital medicine not only treating everything from cancer, Crohn’s disease, childhood epilepsy, PTSD, and countless other conditions, it prevents people addicted to tobacco and dangerous opioid painkillers from having access to a potential cure. Claiming you have the country’s best interests at heart while ratcheting up the effort to prosecute those who use a plant, for any reason, belies Trump’s actual goals of placating the somnambulant masses while ensuring excessive laws generate income for prisons, police, and Big Pharma. If the new administration sought seriously for a major victory in the war on drugs, Trump and his cohorts would look to Portugal and other countries where — although kinks are still being worked out — decriminalization of all drugs has had impressive results in reducing crime, addiction, and imprisonment. But broad decriminalization wouldn’t keep Americans addicted to prescription opioid pharmaceuticals — thus yanking the unspoken basis for U.S. troop presence out from under that operation. Broad decriminalization, by nature, means less people would wind up mired in the boggling complexity that is the court and prison system. Something darker than pure profit motivates political drug warriors, however — this isn’t just about the money. Cannabis prohibition and the classification of substances as arbitrarily harmful — despite voluminous evidence even so-called harder drugs like LSD, psilocybin, and cocaine have viable medicinal qualities — represent an insidious method of control. American society tends to conflate morality with legality, thus instilling a stigma around substances, against those who ingest, and particularly against anyone struggling with dependence. Drugs and users have been horrendously stigmatized throughout the duration of this failed political battle, precisely as former President Richard Nixon desired when he ratcheted up the war on pot in the name of criminalizing the antiwar left and being black. The worse opinion the public maintains of drug culture, the simpler it will be for the State to hoodwink the ignorant into believing the easily-refuted — such as that cannabis holds no medical value and those who partake must be stoners and amoral lawbreakers. This pits citizen against citizen and neighbor against neighbor, as the State encourages everyone to poke their noses in the affairs of everyone else, and dutifully report anything even minimally suspicious. 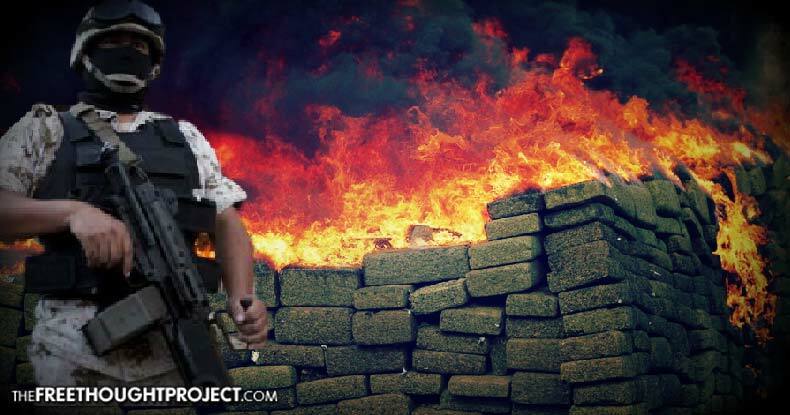 Militarized police investigating drug ‘crimes’ have permission to knock down doors, ransack residences, seize assets — houses, cars, cash, savings, and any valuables — in many cases, when the activity is only suspected of taking place. As a bellicose nation with the most bloated military budget on the planet, our choice of belligerent language aptly describes the war on drugs and its consequences — masking the need to question its validity with the somber overtones of a military endeavor. In telling ways, the United States has surreptitiously held loyal to its Puritanical roots, sanctimoniously denouncing illicit substances on the world stage while secretly taking a toke or snorting a line behind closed doors. This — that Americans, like anyone else, wish to be left to live life without a nanny state dictating what should be verboten — is the elephant in the drug war room. Trump doesn’t want to end the war on drugs anymore than any other president in a succession of administrations who see value in depriving the populace of liberties while profiting off the misery criminalization brings. No matter how tall or impenetrable the president and his supporters build this wall — no matter how tough on crime and drugs, users and dealers U.S. police forces get — nothing will ever stop these substances from circulating. Demand necessitates supply, but rather than legalization and resuscitating the economy through businesses centered on cannabis and hemp, the carbon-copy White House has chosen the predictable, stale, and forever-hollow call to arms against drugs. But in actuality Trump’s heightened war on drugs just another tired manifestation of the government’s war on you.